Now I am allegedly a grown up, I realise that MY toy that parents loathed was a set of green jingle bells. Let's pause for a moment here and recognise who would buy ANY toddler a set of jingle bells? I don't remember who bought them for me, but I remember they were from a shop in Terrigal, NSW. They were GLORIOUS! They made the most amazing sound. I don't remember them going missing, but I do remember being significantly older when they magically reappeared one day. It was only a few years ago that I realised one of my long suffering parents must have hidden them from view. Honestly, who'd blame them? 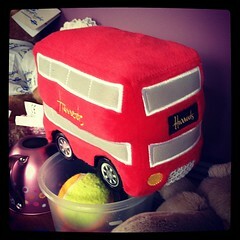 MY toy that I absolutely loathe is a plush red Harrods bus. It is a gorgeous bus, bright red and fluffy, direct from Ol' Blighty. But it takes BATTERIES. It whirs on the floor, bumping into objects and walls, righting it's path and continuing on it's merry way. That's what it's meant to do. It does not work on carpet. Toddler Millie has not worked this out. When it doesn't move on the carpet, she just flips it on it's side, still turned on. And all I can hear is 'WRRRRRRRRRRRRRRRRRRRR'. If you turn the bus off, she comes running over saying 'OH! BUS! ON! GOOOOO!'. At the height of my pregnancy with Pippa, Millie's bus obsession was in full swing. And the bus was magical. By magical, I mean, REALLY REALLY ANNOYING. There. I said it. One day, I could not stand the sound of the bus attempting to journey across the carpet any longer. So I hid it in the top of our pantry. I even wrote about it on Clairey Hewitt's blog and won a year's supply of Garnier face cream. The bus reappeared just before Pippa was born. Mr S found the bus and returned it to it's rightful tiny owner. Then I hid the bus on the top of a bookshelf. Mr S found and returned the bus again. He knows precisely how much I dislike the bus. I think he's wondering how long before I crack, wailing maniacally and stabbing the bus. Yes, I could just take the batteries out. However, Millie now brings me anything that doesn't work saying 'Battees Mum please?'. It's easier to remove the bus altogether. I have tripped over the bus in the dining room, kitchen and bathroom in the last 24 hours. I fight a losing battle with all toys in this house, the Harrods bus being the bane of my step-on-toy existence. At least it's not painful like lego. It's a plush, soft, step-on-toy experience.